Filed to: Wario Land: Shake It!Filed to: Wario Land: Shake It! Still puzzling over Nintendo's cryptic announcement from earlier today? Hold on tight, cause they're not even close to done marketing at you. The company has announced that they're teaming up with Six Flags this month to infuse 10 theme parks across the country with Wario-themed frivolity, possibly including being gassy in public. 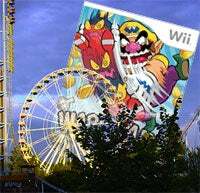 Fans attending the parks (list after the jump) will be able to get their hands on Wario Land: Shake It! for the Wii at special demo kiosks. Such an invasion. Why do they do it? "Wario Land: Shake It! is a game that everyone from veterans to newcomers can enjoy," said Cammie Dunaway, Nintendo of America's executive vice president of Sales & Marketing. "Partnering with Six Flags to bring the title to theme parks nationwide is a great opportunity for consumers to experience the game and rediscover the franchise at a place that is designed for fun."